Murrell Freight Lines has one Kenworth T909 in its fleet, and Paul Anderson is the lucky driver behind the wheel. Standing out: You can’t miss Murrell Freight Lines’ colour scheme. 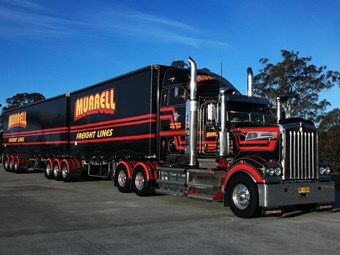 Illawarra-based Murrell Freight Lines boasts one of the more distinctive colour schemes on the road. The fleet, which is mainly Kenworth, contains 20 trucks for local work and eight interstaters. Murrell’s sole T909 is driven by Paul Anderson, who is also the company’s longest serving driver. Not surprisingly, Paul is happy to be driving the big Kenworth. It has a Cummins exhaust gas recirculation (EGR) engine set at 600hp (447.4kW) with an 18-speed gearbox and air bag rear suspension. Paul says it’s as good as it gets for a driver that does interstate and long distance work. "It’s great to live in, it has a microwave, toaster, TV, Icepak … everything I need I have," he says. It’s a similar set-up in the other Murrell interstate trucks, which will go wherever the freight takes them. Cairns is a regular destination, as is all of north Queensland. Paul has also taken the T909 to Perth, as well as a run to Darwin last year. "Murrell’s are very good to work for. There’s a lot of pride in the company and how it presents itself as they look after their staff and gear … just look at what I am driving," Paul says. The company’s main freight includes hauling containers to and from Port Kembla where it has a large storage area. There staff unpack and store the containers until they need delivering. With the mass maintenance program the truck is enrolled in, Paul can run the truck at 68 tonnes. However, the length of the T909 is only able to pull a 32-pallet B-double. Plus there’s no bull bar up front. "It’s too big," Paul says. "It’s a bit of a drawback every now and then. One this size is all right — they can work around it — but if they had three or four, it wouldn’t work. "Hence, this truck will be their only T909 unless the rule is changed." Murrell Freight Lines’ Kenworth T909 is Owner//Driver’s Truck of the Month for March. You can read the full story in the upcoming edition of the magazine.